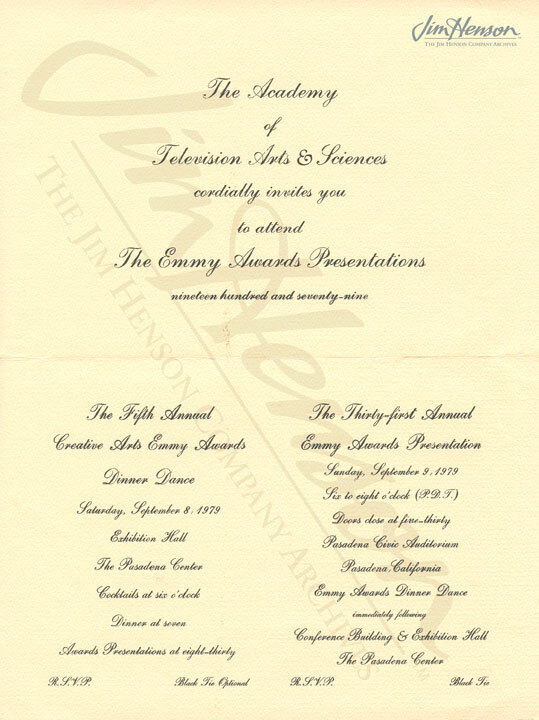 When Jim flew out to Los Angeles, he was no stranger to Emmy Award ceremonies. He won his first Emmy back in 1958 for his Washington show Sam and Friends and had taken home several more of the statuettes for his work on Sesame Street. The Muppet Show was popular with the Television Academy voters and had been nominated nine times, winning two awards by the time Jim and Frank Oz appeared on the 1979 telecast. Awards shows are difficult to enliven for television audiences, so the producers of the Emmy program, looking for entertainment value, were eager to incorporate the Muppets into the proceedings. 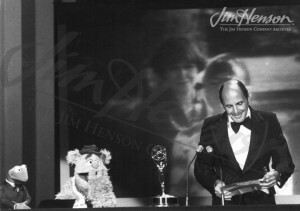 In 1977, the first year they were nominated, Kermit and Fozzie were assigned to present the award for Outstanding Writing of A Drama or Comedy Special – Adaptation. They made a joke about the difficulty they might have opening the envelope, given their physical limitations. Fozzie theatrically dropped it, coming up with the enclosed card (with some help from below), thus solving the problem. That year, Rita Moreno won for her performance on The Muppet Show. 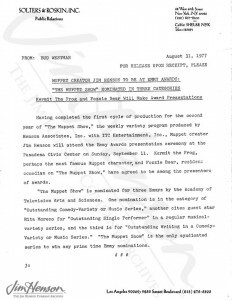 Press release about Kermit and Fozzie’s 1977 Emmy show appearance. Kermit and Fozzie on the 1977 Emmy Awards show. 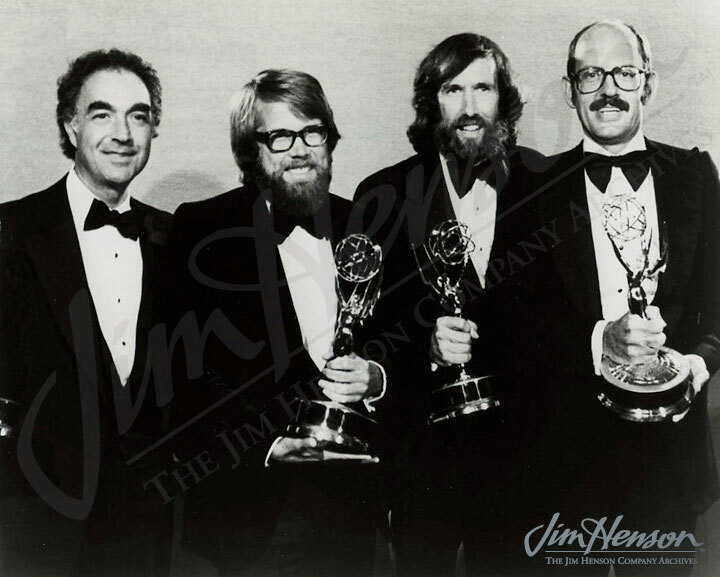 Dave Lazer, Dave Goelz, Jim, Frank Oz with their Muppet Show Emmys, 1978. Photo courtesy of CBS. 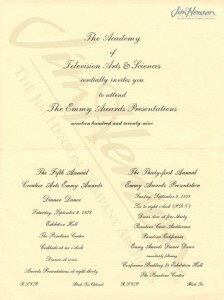 Invitation to the 1979 Emmy Awards Presentations. 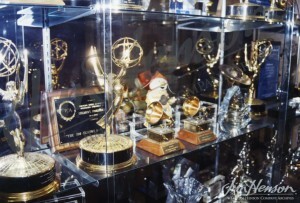 Various awards on display at The Jim Henson Company. 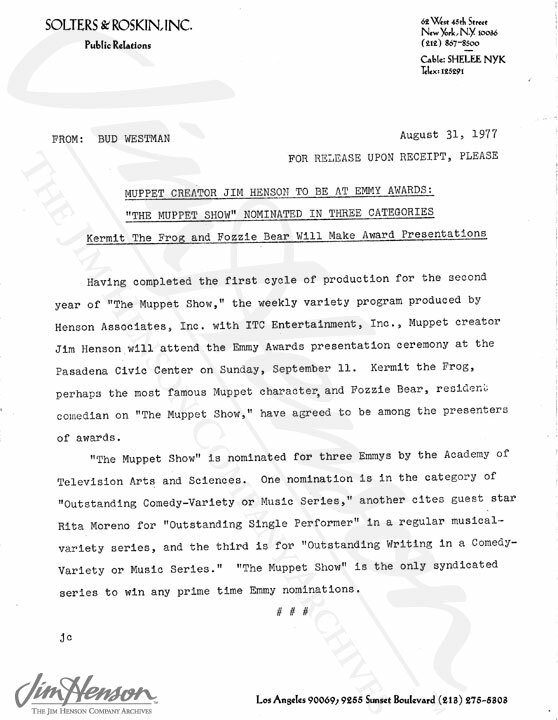 This entry was posted in 09-September '79, 1979, Appearances and tagged Emmy Awards, Frank Oz, Kermit, Miss Piggy. Bookmark the permalink.